You are here: Home / Do It Yourself / How to Make a Wedding Veil in 5 Easy Steps. DIY bridal veil. If you are like many budget-minded brides, you are uncomfortable with paying a lot for the veil you want. The good news is you don’t have to. There are discount veils available (these are all under $20-ish, many much less). But if you would like something more custom, why not DIY? Below is a series of tutorials on how to make your own wedding veil, step-by-step. You can watch videos and/or read instructions, whichever you prefer. These were the first videos I ever did, several years ago. You can tell I was SO NERVOUS. I don’t know that I’d be much better now, but that goes to show whatever you are thinking you do not have the courage to do, you actually can. Also, apologies we weren’t closer to the camera. I hope the image shots make it clearer. End of the sidenote. Back to the topic. If you are thinking you do not have the talent to do this, think again. The number one rule for my do-it-yourself videos is I have to be able to do it all by myself. On the 10-point “craftiness” scale I am a 2-3. 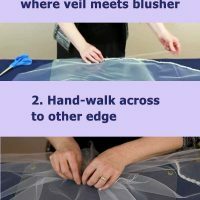 What’s in this “How to Make a Wedding Veil” DIY? An overview of my five-step veil making process is below, with the very first how-to video I did EVER at the bottom. There are additional videos and transcripts detailing those steps through the links below. 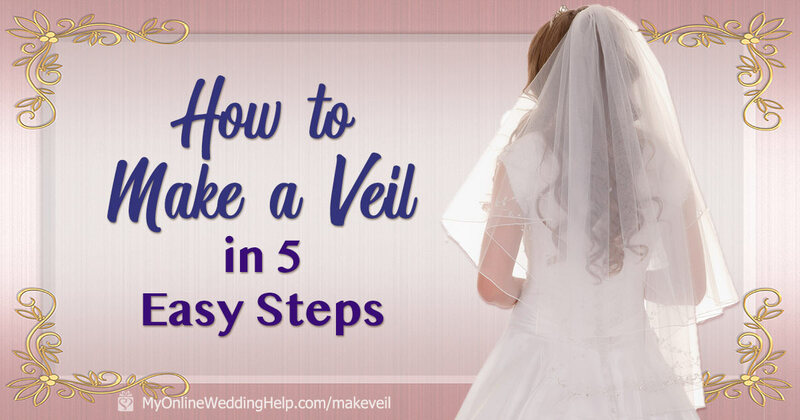 These are the five steps to making your own veil. Step 1: Measure and cut the veil fabric with your own, homemade pattern. Because a veil is made from modified circle(s), creating your own pattern is simple. Step 2: Make the blusher. My blusher is part of the veil. But you can also do a detachable version instead. Step 3: Glue embellishments and trim. Step 4: Create the gathers. It is easier than it sounds! 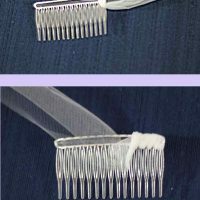 Step 5: Sew on the veil comb. This makes it convenient to securely attach the veil to your hair. If you’ve made a DIY bridal veil, please show it off! Click over to this pin on Pinterest and upload a photo. If you are trying to decide whether to make your own veil or not, read Your Veil: DIY or Buy? How do you make a pencil or rolle edge on a bridal veil if you do not have a serger on your sewing machine? Some people use a zig zag stitch instead. Fold the material edge over like you are going to do a little hem. 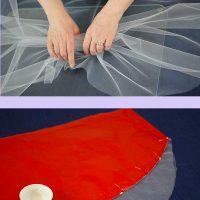 Then place it so the right zig barely misses the tulle and the left zag catches it. When you are done trim off any excess tulle. 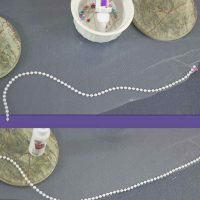 You could also try buying a piece of matching lightweight cord or yarn and sewing it in. Careful gluing instead of stitching may work, too. But I’m not sure. You’d have to experiment with that to see what it looks like.